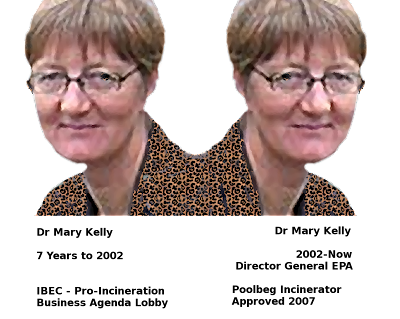 The Galway Tent Blog: EPA: Mary Kelly - Head of EPA should resign. "Dr. Kelly’s remarks are grossly partial toward the incineration industry and appear to be more helpful toward meeting their commercial needs rather than upholding proper environmental standard." Green Party (2003). Dr Mary Kelly's first day in 1995 at industry lobby group IBEC started with a breakfast meeting in the Environment Minister’s office. Her appointment by the Environment Minister to the EPA job in May 2002 led to criticism from environmental campaigners who described her as a poacher turned gamekeeper. 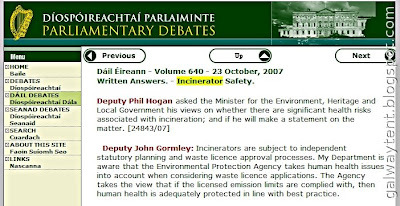 2003: Asked to resign because of grossly partial pro-incineration stance. 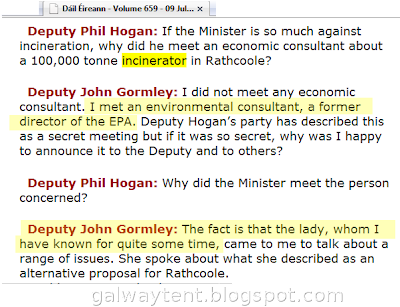 The incineration industry in the USA and in Ireland, including Covanta (USA, Poolbeg-Luxembourg & Rathcoole-Virgin-Islands), has hired former senior US and Irish EPA employees, so it’s quite possible both the US EPA and the Irish EPA are compromised. There is a possibility that EPA-Ireland is totally honest and is not utterly compromised as stated by the Green Party of Ireland's Environment Minister. It is also possible the revolving doors at director level between EPA-Ireland, the IBEC Lobby, Indaver, Covanta-Poolbeg, Covanta/Energy Answers and “Independent Consultants” have no effect whatsoever. The Green Party has called on Dr. Mary Kelly, Director General of the Environmental Protection Agency, to consider her resignation following remarks made by her in a newspaper article that domestic incinerators would be built throughout Ireland. 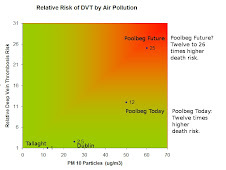 Green Party Cork South Central TD, Mr. Dan Boyle, in whose constituency it is proposed to locate a national toxic waste incinerator at Ringaskiddy, called for Dr. Kelly’s resignation today in the light of her comments that Ireland would get incinerators. 'Dr. Kelly’s comments are a resigning matter because they call into question the supposed impartial role of the EPA in assessing whether such incinerators should be allowed. 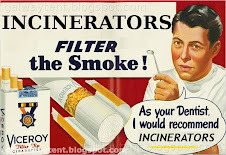 Dr. Kelly’s remarks are grossly partial toward the incineration industry and appear to be more helpful toward meeting their commercial needs rather than upholding proper environmental standard,'. The Environmental Protection Agency is guilty of gross negligence in the exercise of its duty of care to our Community. The EPA appear unwilling or unable to enforce the conditions of this licence. The EPA has on file at least 1,300 complaints. Green Party: We also demand that the EPA do their job and Mary Kelly finally meets us face to face to account for her total failure to enforce the Waste Licence.